Sleep the Owls was started intentionally as a two-piece with a specific sound in mind. I love my 335, but it just isn't big enough for StO. Necessity begat Grendel, 100% designed and built from scratch for our sound. I'm not into pickup switching and tons of knobs. Here is Grendel, simple, primal, and mean. 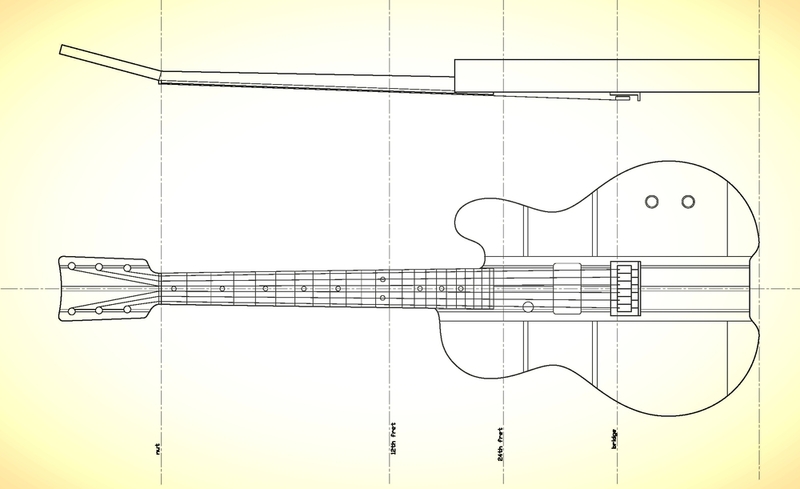 She has a single P90 pickup placed in middle(ish) position and a volume and tone control to respond to room acoustics. I added a custom single string pickup under the bass string running to a separate output to emphasize the low end. She has a 7 piece hard maple and black walnut neck-through body, with a clear coat to show off the wood work. See below for her origin story. The original sketches show the basic shape and wood species layout I had in mind as well as the laminated neck-through body style and my fascination with bookmatched end grain. The final assembly drawing. 24-3/4" scale length and all the angles figured out. The neck is 4 pieces of opposing grain walnut with 3 pieces of hard maple. 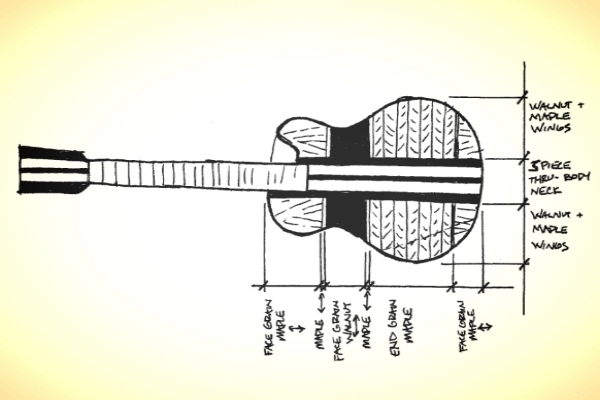 The center piece is sized to the truss rod. The body wings are assembled from blocks of walnut and maple. The widest part of her hips is made from bookmatched end grain pieces to get the zigzag patterning. The end grain soaks up the finish more than face grained to get a thrd value. I rubbed mineral spirits on the top half to show what that looks like. The bottom half is raw. I ended up going for a value somewhere in the middle. Detail shot of the bridge, pickups, and lower neck. All she needs now is some trim plates and to be wired up. She still looks good after a couple years of playing out. She has more in common with Gibson guitars, but she prefers to play with Fender amps.